All inclusive Malta holidays are well known for their blazing hot temperatures and lively town life. The main areas of the island are St Julian’s, Bugibba and Mellieha bay as well as the small offshore island of Gozo. All inclusive 2019 / 2020 packages in Malta are not ideal for beach enthusiasts as usually the beaches are quite small and rocky. The largest beach would be Mellieha Baywhich is also the sandiest and possibly the best one in Malta, although the island is still great for watersports and glass bottomed boat trips are also available. Malta holidays are good for couples although there isn’t a lot for children to do. One exception to this rule is a visit to the Popeye village near Mellieha where the feature film of the famous cartoon series was filmed. The village is completely made of wood and a boat tour encircling the village is also available, giving kids and grown-ups the chance to cool down with a bit of sea air. 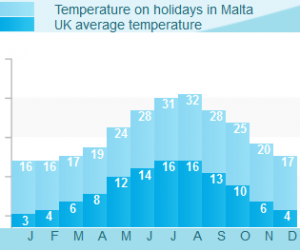 Swimming is also a cheap and easy way to keep kids entertained on holidays in Malta and also a great way to prevent them getting too hot and overtired. All inclusive holidays in Malta holidays also give travellers a lot more choice than some other sunny escapes. St Julian’s has a large fishing harbour at Spinolla Bay with a wide selection of restaurants and cafes, while the inner city area of Paceville has a vibrant club and bar scene. Dragonara follows Paceville as a lively spot for nightlife with casinos and public pools that can be used in the daytime. Spending time on Malta all inclusive means that there is plenty to do for people who prefer to get up and go. Bugibba is a smaller resort to spend your holiday but is still bustling with busy cafes, restaurants, beach bars and clubs. The beach is a bit rocky so this is more of a destination for lounging about the pool. A Megalithic temple can be found here if you feel like soaking up a bit of culture for the day in Malta. A casino has been built in front of this temple so you will have to enter the casino first in order to find the temple’s main entrance. Mellia Bay is built around the town’s long lazy stretch of sandy beach and many beach bars and nearby shops in St Paul’s Bay can be found on a break to Malta here. The spot has a relaxing atmosphere making you feel at ease as you lay back on the sand looking out onto the crystal waters.